The mechanical back pain may be the result of inflammation of the joints of the spine, strain and sprain of the muscles and ligaments of the spine or it may come from the disc space itself. Pain down the leg or arm following the course of a specific nerve root is a result of irritation or pressure on that nerve root. Other conditions such as infection, tumor and medical conditions such as an abdominal aortic aneurysm may also cause back pain. A large number of patients who experience pain in the back, neck, leg and/or arm will improve with conservative care. Many of these patients will not require surgical procedures. 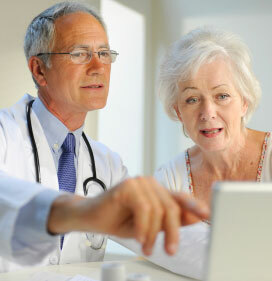 Physical medicine therapies and the many modalities which it offers may be of great benefit to certain patients. Traction: Patients experiencing acute or chronic pain in the low back and neck often feel relief with traction applied to the cervical or lumbar spine. Traction decreases the pressure in the disc space and helps to open up the neural foramen through which the nerve roots leave the spine. There are a variety of techniques which can be used to achieve this traction. We implement the use of the Accu-SPINA Therapy Table. The tension applied to the neck and low back is a gentle one and is increased as the sessions progress. Heat and Cold: Moist heat helps to relieve muscle spasm and inflammation caused by strain intention. Generally cold packs are applied to the painful area within the first 48 hours after an injury. Heat is applied after 48 hours. Ultrasound: Ultrasound is used to deliver heat to the deep tissues. While hot packs are good at warming up the skin and tissues immediately below the skin, they are not able to reach the deep muscles of the low back and neck. Massage: Massages may be very beneficial in reducing pain and spasms in affected muscles of the neck and low back. Myofascial release is a form of localized massage which is aimed at the fascia which surrounds the muscle. This helps to loosen tight tissue and scar tissue. Electrical Stimulation: Electrical stimulation helps to enhance healing, decrease swelling and decrease pain. Surface patches are placed on the skin over the affected area of pain. The electrical current effects both nerve and muscle cells. Braces: Braces for the neck and low back decrease movement and give extra support to the affected region, reducing some of the strain of the area.